All beads in the CzechMates Beading System® feature the same hole spacing for maximum compatibility and enhanced design flexibility. For your convenince all CzechMates beads are in this section where you can search by colour and/or shape or you can find them in their individual sections, with other brands, below. The CzechMates Two Holed Bar bead shares the same perfect hole spacing as the rest of the CzechMates system giving you enhanced design flexibility. The latest addition to the Building Blocks of Modern Beading® is the Beam. Use this unique 3-hole bead to create motifs that suspend, extend, and intersect within your designs. Bi-Bo Czech glass beads have a unique hourglass contour that cradles other beads, opening a myriad of design possibilities. CzechMates Two Holed Brick beads share the same perfect hole spacing as the rest of the CzechMates system giving you enhanced design flexibility. The latest addition to the Building Blocks of Modern Beading® is the CzechMates Cabochon. The 2-hole Cabochon adds dimension to your jewellery. Called a cabochon because of their flat back these two holed 6mm beads can be used in bead weaving and bead embroidery. Use as a bead or a cabochon. Chexx beads are 6x6x3mm two holed beads. The holes are 0.8mm in diameter and drilled through the face of the square. New from Preciosa, the Chilli bead is a two holed petal shaped glass bead. The beads are designed to be used in several ways. They can fit facing the same way like a zip or face each other enclosing a round bead of up to 4mm. Chilli beads can be used with other Preciosa beads such as the Thorn bead or with other two holed beads. Cup button beads are 14mm glass button shaped two holed beads. A versatile bead they can be used in many ways in kumihimo, stringing, beadweaving and other crafts. The delicately curved Crescent is ideal for sculpting arches, wedges, and frames in your designs. It shares the same hole spacing as the other beads in the CzechMates® Beading System. CzechMates Two Holed Dagger beads share the same perfect hole spacing as the rest of the CzechMates Beading System giving you enhanced design flexibility. DiamonDuo - A True Gem Among 2 Hole Beads- add a faceted shimmer and shine to your bead designs. Combine DiamonDuos together to create a textured mosaic design. 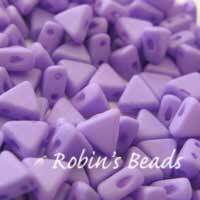 The versatile shape works well with Tango beads and other two holed beads and seed beads. eMMA beads are three holed triangle beads. The holes are drilled through the face of the triangle so can be used to quickly add a third dimension to your beadwork. The triangles have equal sides of 6mm and the bead is 3mm thick. A diamond shaped bead from Matubo. Its unique flat top shape and sharp lines allow the beads to nestle together with barely any space or gaps between them. Honeycomb beads are two holed 6mm hexagonal beads. The holes are 0.8mm in diameter. Honeycomb Jewel beads are faceted on one side. Add some Parisian chic with the new Kheops® par Puca® bead. Unable to find the right beads to embellish her newest creations Annick Puca, a well known French jewellery designer, created this triangular bead with two parallel holes. CzechMates Two Holed Lentil beads share the same perfect hole spacing as the rest of the CzechMates Beading System giving you enhanced design flexibility. MiniDuos are the new baby brother of the popular SuperDuo bead. Like the SuperDuo they are oval shaped two-holed pressed bead, even in size and suitable for all sculptural designs. Use the MiniDuo to miniaturize SuperDuo designs, create thinner and lighter designs or combine with SuperDuos to increase texture and form in designs. From the manufacturer of the Original SuperDuo comes the Unique Nib-Bit Bead. Each Wedge Shaped Nib-Bit 2-Hole Bead features a beautiful, highly polished surface and a pair of precision drilled, spacious parallel holes designed for easy multi pass-through with your favourite beading thread. PiggyBeads are a new dome shaped bead from the Czech Republic. The bead is 4x8mm with one central and one offset hole. Pyramid beads are stud shaped beads with a square base and two parallel holes. They are also known as Bead studs. The CzechMates QuadraLentil bead is the same shape as the CzechMates Lentil but with four holes. Part of the CzechMates Beading System they share the same perfect hole spacing giving you enhanced design flexibility. The CzechMates QuadraTile bead is a four holed tile, part of the CzechMates Beading System, with the same perfect hole spacing giving you enhanced design flexibility. The low profile thickness and flat surface area make the QuadraTile a universal component that adds structural integrity and connectivity without bulk. It's a great base plate for arches and foundations in dimensional designs. RounDuos are 5mm round pressed beads made in the Czech Republic. They have two parallel holes of approximately 0.8mm. Rulla® Beads are a new bead from the Czech Republic. They are 3x5mm cylinders with two holes. 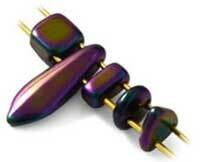 Silky beads are a new two holed bead from the Czech Republic. They are 6mm squares, 3.7mm thick with two parallel holes of 1 mm in diameter run diagonally across the bead. One side has a ridge down the centre, the other side is flat. The bead can be used either way up. SuperDuos are oval shaped, two-holed pressed bead with a dimensions of 2.5 x 5 mm. SuperDuos are pressed and therefore even in size and suitable for all sculptural designs. With certain designs SuperDuos may be used as a substitue for Twin beads but Twin beads cannot usually be a substitute for SuperDuos. Super8® beads are the most delicate version of double holed beads. In the shape of an 8, approximately 2.2x4.7mm, with a slim waist they can be used to replace Twin and SuperDuo beads in many designs giving a more graceful, lighter, result. Tango beads are triangular shaped two holed beads that work well with DiamonDuos and other multi holed beads. Tila beads are 5mm flat squares and Half Tila beads are 5x2.5mm. Both are 1.9mm deep, drilled with two parallel holes 0.8mm in diameter. Both have one flat side and one slightly raised in the centre so it can catch the light. We have 6mm CzechMates Tile beads. Other tile beads are available in 6mm, 8mm and 12mm. Tile beads are flat squares drilled with two parallel holes 1.25mm in diameter. The corners are pressed so they are softly rounded and will not cut into your skin or thread. 6mm tiles are approximately 3mm thick, 8mm tiles 4mm thick and 12mm tiles 5mm thick. CzechMates® Two Holed Triangles share the same perfect hole spacing as the rest of the CzechMates beading system giving you enhanced design flexibility. Twin beads from Preciosa are oval shaped, two-hole seed beads 2.5 x 5 mm. They are made in the same way as round seed beads by extruding and cutting molten glass. This results in some irregularity in shape and makes them most suitable for orgainic sculptural designs. They are a slightly flatter than SuperDuos so can't usually be substituted for them. Zorro beads are a new two holed bead. The holes are parallel through the top and base of the Z. Use them on their own, with other two holed beads or seed beads to add some flare to your beadwork.